It began with an overseas phone call to then auxiliary bishop for the Archdiocese of Detroit, Michael Judge Byrnes. Byrnes: So the only people I know there, it’s probably the Nuncio and sure enough it was, and he said, ‘are you alone?’ Well I was seated by myself. There was nobody next to me, so I said, ‘kinda,’ so he went right into it, saying the Holy Father wants to appoint you as Coadjutor Archbishop of Guam. And he went on and on explaining, seemed like he was a little nervous, at least that was my impression. So I said, ‘The Holy Father wants to appoint me?’ And he said, yes. So I said, ‘I’ll do it, if you can tell me what we need to do. He said, ‘First of all, you’ve got to go to Rome, because Cardinal Filoni, the head of the Evangelization of Peoples says the Holy Father wants to meet the gentleman who will be the priest and the bishop who will go to Guam.’ So we had to make arrangements and I flew back to the U.S. and then in about two days, I flew to Rome. Archbishop Byrnes did meet with Pope Francis, “a huge honor” and gradually learned more about his new assignment. Byrnes: Whenever someone tells you ahead of time what’s going on and they say, ‘these are the different challenges,’ it’s all theoretical. It wasn’t until I got here that I realized, wow, there’s a lot going on here. At the time of Archbishop Byrnes’ arrival on Guam, ten clergy sexual abuse cases had been filed in local courts. That figure now exceeds 140. Based on his previous experience in the states, the archbishop said even a single case often suggests there are more to be revealed. Lloyd: People who live here or have been here for a long time tend to think of Guam as the center of the universe. I’m curious though, within the church, had you ever heard anything of these controversies? Byrnes: No. Absolutely not. I knew maybe where Guam was. Archbishop Byrnes got a briefing from members of a delegation that had visited Guam. Byrnes: They kind of filled me in, but just hearing it or reading it just doesn’t measure up. Lloyd: What struck you first when you got here? Byrnes: The first memory I have was flying in, flying by the island and thinking, ‘this is small.’ There were a lot of lights. That was cool because people back in Detroit were saying, ‘Oh my gosh, you’re going to Guam.’ They were thinking I was going to live like in a grass hut. I said, ‘no, no, no.’ The city of Detroit, with two of the larger suburbs, that would be the size of Guam. My first impression was that it is small, but as I’ve come to live here and explore, in Detroit, there’re no mountains. We’ve got mountains here! [Laughs] And we’ve got an ocean. And lakes. This was good news for Archbishop Byrnes, an enthusiastic swimmer, who soon grew to love the Pacific Ocean. Byrnes: I swim over at Ypao Beach at least once a week, sometimes twice. I use the pool down here [Hagatna] too. So I’ve done some swimming and some hiking. I’ve gone to Tarzan Falls. Did a nice hike up in Ritidian with a guide, Nash Camacho, into some of the latte sites. Stateside relatives have visited and the archbishop has struck up friendships with some local families, “so yeah, it’s becoming a lot like home.” But the sexual abuse cases and the lingering effects of years of mishandled diocesan finances have consumed much of the archbishop’s intensive work schedule. Byrnes: Those are the two. The very first day I landed here, got in at 1 a.m., and that’s when I had a chance to sleep a little. 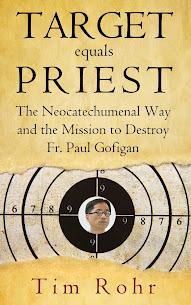 At 10 a.m., I met with the priests and then at 1 p.m., I met with the lawyers. My memory is a little hazy, but my first recollection is being told, ‘the lawyers are here and you’ve got to talk to them.’ Of course it was a different set of lawyers than we have now. The first set of lawyers helped us, but we finally discerned a different path, more of a mediation, settlement kind of path, so I’m much more comfortable with where we are now. Lloyd: Was the initial approach more like denial? Byrnes: No, it was more like questioning the statute. We ended up filing a motion to dismiss the statute—the statute of limitations—and so we haven’t pursued it, partly because we went in a different direction of a more victim-centered approach. Lloyd: From what I’ve seen in federal court, Archbishop Apuron hasn’t abandoned that. Byrnes: Right, and we’ll see how that goes. Lloyd: Have you ever had an opportunity to communicate directly with Archbishop Apuron? Byrnes: Shortly after I was appointed I went to Baltimore for the United States Bishops’ Conference meeting and I got a phone call from him saying, ‘I’m on my way, can we meet in Baltimore?’ We had breakfast together and, it was a very superficial conversation. So we met at the hotel where all the bishops were and he went up and greeted a number of them and left. So that’s been my only communication with him. Lloyd: You’ve stressed openness on this matter. Has that left you feeling that there should be some more thought given in Rome to approaching things that way? Byrnes: As far as transparency, financially, our first efforts at it, we posted the Chancery’s financial situation. Transparency to me is protection in a certain sense. Protection of integrity. The Archdiocese should always be above suspicion and be transparent with what we have as a way of expressing… Hiding invites suspicion. It invites questioning of what is really going on and I’d rather make it clear. This is what is going on, the good, the bad and the ugly. Transparency is always an advantage, because trust is so easily lost. I walked in to a situation where trust had been lost. It’s easily lost, it’s hard to win it back. I just think it’s the way to go. Archbishop Byrnes feels he has made progress in winning back trust from the dissident faction that has led protests against the previous leadership. Byrnes: When you walk into something, you can either expect the people are going to be your enemies or your friends. I’d rather expect them to be my friends, so I tried to walk in with that. I think there has been some trust won. I’ve had some conversations with Mr. Camacho and Mr. Sablan. During his first year, Archbishop Byrnes has announced the imminent closure of the the Redemptoris Mater Seminary in Yona, which is controlled by the Neocatechumenal Way, saying its operation on Guam is not sustainable. The relationship between this group and Archbishop Apuron has been a central part of the church controversies of recent years. Byrnes: I know some of their priests. I’m regularly at their parishes for fiestas and confirmation, that’s just normal, every day. 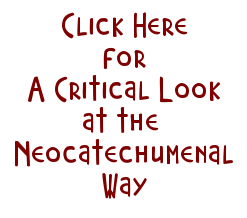 A couple of people in the Chancery are part of the Neocatechumenal Way and it’s not an issue. The seminary has been a point of contention. There’s of course disappointment [about the closure], grief. There’s been a huge investment of time, personnel, finances in the work of the seminary. There’s definitely been some grief expressed to me and some anger. Grief and anger often go together. I know what I’m doing is really difficult for them. It wasn’t an easy decision to make. Byrnes: I don’t tend to follow the blogs, though I get some information from them. And there was some pushback on that, but we all live where we live and that’s our perspective in reacting to things. P.S. Dear haters. Your attack on my family will not work. I will persevere. God is my judge.